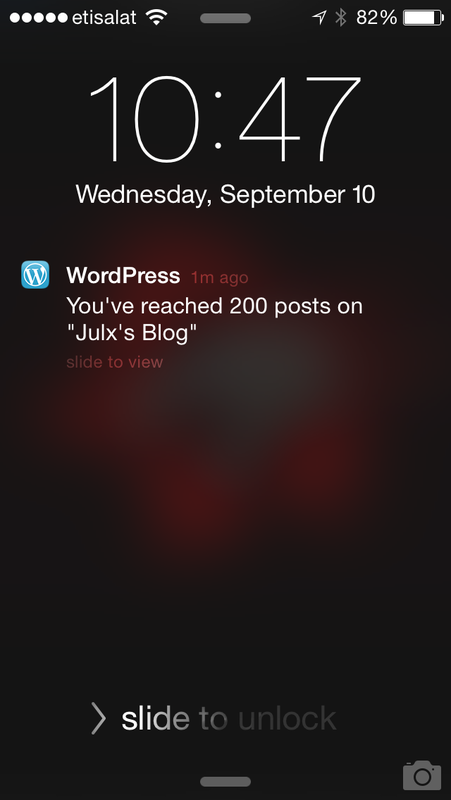 As pic suggests, on September 10th, the blog reached a milestone – 200 posts. Seems like quite an achievement; quite a journey actually. The blog and the whole history does not start with WordPress. This blog and most of the old the articles that were in it, initially began on a social networking site known as Geeks. The site is social networking hub like Facebook started by Chris Pirillo. Those you who are unfamiliar with Chris, he’s a Youtube celebrity who does tech reviews, etc. Geeks is sort of the place where we would meet like minded people and discuss tech issues and other things. I started posting my opinions on tech and cars, the issues I have in Dubai, etc. Did not consider it to be anything that anyone would like to follow. To be honest, I don’t even know if I had any followers on that blog. Unless someone made a comment, I never knew if anyone ever noticed the articles I posted. I stopped posting. Not due to my articles not being acknowledged, but realistically, I had nothing to say. And when it came to the point that I did, I completely forgot about it. A friend who was on Geeks pointed me to this other social site for us like minded people. Thanks DTM. At this point I came to know that I could have a blog on here too. To top if certain issue that I needed advice on and so my 1st set of articles would focus on just that – Girl Trouble. The response that I got was overwhelming. So much friendly advice and support, that I decided I was going to transfer my blog over. I copied all the articles I wrote on Geeks and posted them. The blog was going great. So what brought about this. If the blog was going great on Lunaticks, why did I transfer it here? Well, it all has to do a girl. A casual mention of my blog in a conversation and one day she asked me about the blog. She asked whether it is a public or private one and whether I could forward the links for her to see it. As you can imagine, I was excited that she would show some interest in something of mine. So, I did, but it appeared that she needed to be a member of Lunaticks to order to see it. She’s no Geek, so I guess that she wouldn’t even consider joining. It was then that I thought I should make the blog public so that I could reach a wider audience. Google searched to find out which blogging site was the best and from all the reading I did, WordPress was clearly the best. It even gave me the ability to get the blog to look the way I wanted it to; which the others did not. Its no surprise – the sites were social networking places. So I transferred all the articles over and gave her the link. The only thing is that I didn’t think it through. A week after giving her the link, I only just realized that she could read the articles. O Dear… What have I done. As it stands, the articles are still there and I don’t think that I would remove them. They’re part of the Blog, part of its charm I suppose. So far I’m happy with the blog and the way that it looks. It has been nominated for awards; to which I’m completely honored. Granted that recently I have been mostly re-blogging other posts, I’m still happy. Followers of my blog will note the difference in the way it looks. I decided to spend some money and buy a theme. It looks better for it. At this point, I’d like to thank all my followers and passing readers. Your support is really appreciated. Thank You.